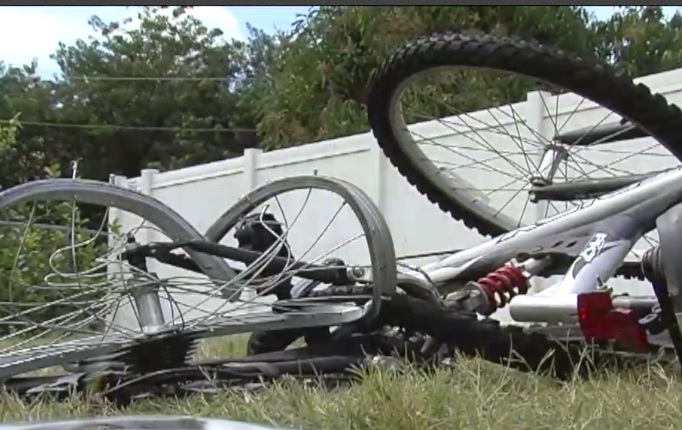 PORT SAINT LUCIE, Fla— — A teenage victim of a hit and run is home recovering at his family’s Port Saint Lucie home. However, his mother is pleading for the public’s help in finding the person responsible for her son’s injuries. 18-year-old Anthony Morales was riding his bike home from a friend’s house early Sunday morning when someone driving in a car crashed into the teen outside the Seventh-day Adventist Church off South West Tulip Blvd. “I was unconscious and this guy had the audacity to leave me there,” said Morales. The high school senior was found unconscious by a good Samaritan who called 911. Morales was taken to a nearby hospital where he learned he broke his tail bone, tore a calf muscle and received several lacerations to his body. “Anyone in this world makes mistakes, God knows I have, but you don’t leave a teenager or a dog or anybody on the side of the road for dead,” said Anthony’s mom Hope Estrada. His mother immediately made flyers to hand out in the community to try and find the suspect. She also found pieces of the car left behind at the scene, which she took to a local auto body shop to find out what type of car hit her son. “So we are looking for a Toyota with one missing hub cap or we are looking for a Toyota with all the hub caps missing, that’s trying to hide it,” said Estrada. The mechanic said based on the information obtained on the hub cap it’s a 2012 to 2019 Toyota Prius that will have damage on the right side. “You’re hurting a whole family, you’re hurting a whole community, God only knows if this is the first hit and run, I would appreciate it if you turn yourself in,” said Estrada. The family is offering a $5,000 cash reward to anyone who has information that leads to an arrest. The Port Saint Lucie Police Department says right now they have no suspects or any leads in the case. If you know anything you can remain anonymous, but you are asked to call and talk to a detective at 772-871-5000.